Port Akdeniz (Ortadoğu Antalya Seaport Management Inc.) is a joint venture in which Çelebi Holding subsidiary Çelebi Investment Consultancy & Management Corporation Inc. has joined forces with Global Yatırım Holding subsidiary Global Liman İşletmeleri A.Ş.  and with Antmarin İnşaat Turizm ve Ticaret A.Ş. 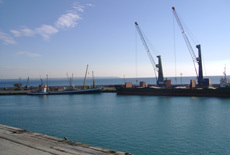 to win the contract to manage the Port of Antalya for twenty-two years. 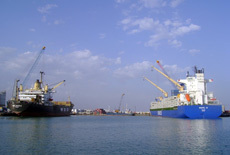 The joint venture took over the management of Port Akdeniz in 2006. 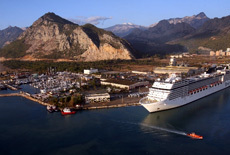 The Port of Antalya plays a major role in Turkey's international maritime trade. This is a multipurpose port that includes facilities for cruise ships, container ships, and bulk cargo vessels as well as a yacht marina. Antalya ranks high among the ports in Turkey with the greatest developmental potential. Çelebi Holding's has put the knowledge and experience that it has gained in airport terminal management to Port Akdeniz and make it a major port of call that meets the highest international standards for both passenger and cargo traffic. As a result of infrastructure work that is finished in a short time, the port is now capable of serving high-tonnage vessels while its terminal is completed to make Antalya one of the most important liner ports serving southeastern Europe. 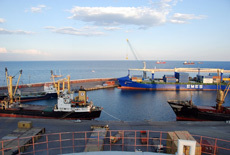 As a result of a strategic decision, Çelebi has transferred its shares in Port Akdeniz on 29.07.2010. Playing host to 8 million foreign tourists a year, Antalya has been growing rapidly as a key location in Turkey's tourism and trade. Its port, occupying a total of 166,800 m² of area, is the biggest breakwater-protected harbor along the 624-mile coast between İzmir and Mersin. Located at Kemer, the westernmost point of Turkey's Antalya province, Port Akdeniz is superbly situated on the Mediterranean while first-class highways connect it with major centers of tourism and industry such as Alanya, Mersin, Konya, Akşehir, Afyon, Burdur, and Denizli. Teamed up with Antalya international airport's hefty domestic and international passenger capacity, Port Akdeniz has been playing a complementary role in making this region a major transportation hub. Port Akdeniz contains two breakwaters: a main one measuring 1,440 meters and a secondary one measuring 650 meters in length. The distance between them is 225 meters. The depth of the approach channel is between 10 and 25 meters. Total harbor area in the port is 136,000 m², all of which is usable. The maneuvering radius is 400 meters. Total wharf frontage is 1,322 meters. Among its many facilities the port includes a marina as well. 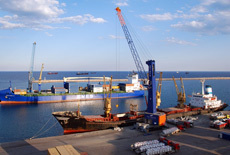 Çelebi expects to takeover the management of the Bandırma seaport in the first half of 2010, following the completion of bureaucratic formalities.